A delicious turkey tetrazzini is hiding under that crust. Turkey is not just for holidays and special occasions. I cook it throughout the year. The leftovers of a roasted turkey can be used in many different meals including soup, sandwich, salad, and pasta. 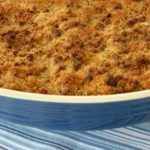 One of my favorites is tetrazzini, a creamy casserole with mushrooms, linguine, and a crunchy topping of Parmesan and breadcrumbs. Yum! Homemade tetrazzini takes a bit of time, about 2 hours from start to finish. There are recipes for simpler and quicker versions using canned soup but I prefer from scratch. The way the flavors of the ingredients come together in the cooking process is well worth the extra effort. One taste and you will know what a difference it makes. My recipe is adapted from one I found by Giada De Laurentiss on the Food Network website. You can find the original recipe here. I made tetrazzini for a family birthday dinner. It is the reason I do not have a better photo or one to show how it looks on a plate. Putting a family celebration on pause to do a photo session feels a little strange. I took a couple of shots after I pulled it out of the oven. I completely forgot to save a little to put on a plate for a detail picture. Then it was all gone. The sign of a good meal. How often do you cook turkey? Is it only for special occasions? It is a good alternative to the all too often chicken routine. Just think of the possibilities of what you can do with turkey…including a comforting meal of tetrazzini. A delicious casserole with turkey, mushrooms, linguine, a cream sauce, and a crunchy topping of parmesan cheese and breadcrumbs. Preheat the oven to 450 degrees F. Spread 1 tablespoon of butter on a 13 x 9 x 2-inch baking dish and set dish aside. Put the turkey in a large bowl and set aside. In a large (5 quart) non-stick saute pan, melt 1 tablespoon each of butter and oil over medium-high heat. Add the mushrooms and saute until the liquid from the mushrooms evaporates and the mushrooms become pale golden. Add the onion, garlic, and thyme and saute until the onions are translucent. Add the wine and simmer until it evaporates. Transfer the mixture to the bowl with the turkey. In the same saute pan, melt 3 tablespoons of butter over medium-low heat. Add the flour and whisk constantly while cooking the mixture for 2 minutes. Whisk in the milk, cream, broth, nutmeg, 2 teaspoons of salt, and pepper. Cover and increase the heat to high and bring to a boil. Uncover and decrease the heat to medium-low and simmer until the sauce thickens, whisking often. Bring a large pot of water to a boil. Add about 3 tablespoons of salt to the water and stir. Add the linguine and cook until it is tender, about 9 minutes. Drain linguine and add it to the bowl with the turkey. Pour the sauce into the large bowl and stir or toss the ingredients in the bowl to combine and coat the pasta with sauce. Transfer mixture to the prepared baking dish. 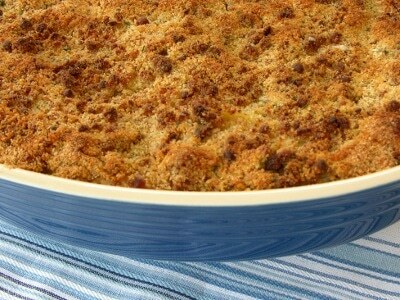 In a small bowl, combine Parmesan cheese, 1/4 cup breadcrumbs, and 3 tablespoons of melted butter. Stir to combine. Sprinkle mixture on top of pasta. Sprinkle remaining 1/4 cup breadcrumbs on top. Bake until golden brown and the sauce bubbles, about 25 minutes. You can cover loosely with foil for the first 10 minutes of baking to prevent over-browning of topping. Thank you Karriann! I sure would if you lived close by. I love to cook and bake for family and friends. I cannot recall ever having tetrazzini until a few years ago. Since then I have to make it from time to time. It is a special and comforting dish.